Damon Colquhoun pitches his project to judges. Each team will use its prize money to produce pilots over the next six months with the help of an executive producer or producing TV station. Then, with NBPC’s support, they’ll pursue broadcast and distribution opportunities. Projects were selected by two panels of industry professionals. TV and broadcast judges were Kathryn Lo of PBS, director of program development, independent film and the syndicated service PBS Plus; filmmaker Llewellyn Smith of Vital Pictures in Boston; and Liz Cheng, g.m. of WGBH-TV. Judging the web portion of the competition were Karim Ahmad, senior digital content strategist for Independent Television Service; Nicole Eley-Carr, PBS senior manager of digital content strategy and partnerships; and filmmaker and producer Topper Carew, currently a visiting researcher/scholar at MIT Media Lab. The event, at the Greene Space in New York Public Radio’s headquarters, drew top executives from CPB, PBS, the World channel, ITVS, POV and WNET as well as representatives from HBO, A&E, Fox, BET, Tribeca All Access and Third World Newsreel. The two needed $250,000 for a pilot shot in Nairobi and $2.6 million for a series of eight half-hour broadcast episodes. They’re targeting a global audience ages 15 to 35. Street Cred, which had already raised $60,000, needed another $215,000 for a pilot and $1.8 million for 13 episodes of a reality show that creator Sharrief described as a cross between The Biggest Loser and The Apprentice, with a public broadcasting twist. He’s aiming for young viewers ages 13 to 30 and women ages 35 to 60. Lo liked the injection of straight-up reality programming in Street Cred, noting that PBS doesn’t do much of that. “We call it reality-esque,” she said. Executives and producers in the room also welcomed the sole scripted offering, the web series Pixie Dust, to a network where original American drama is scarce. 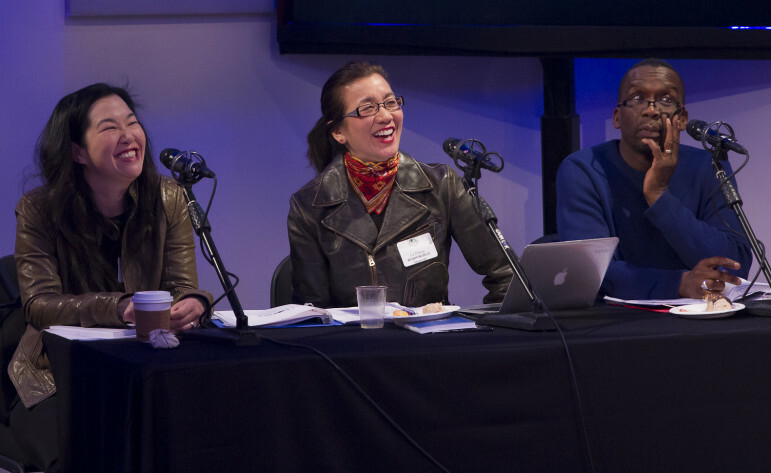 Judges Kathryn Lo, Liz Cheng and Llewellyn Smith react to a contestant. “We’ve been running focus groups on innovative ways to move forward, and this is exactly what we’re talking about,” said Lesley Norman, production executive at New York’s WNET. Pixie Dust sought $215,000 for a first season of 10 five-minute episodes following an intense, mystical mother-daughter relationship, targeting women ages 16 to 36. “We need to get more people in the black community aware of mental illness. We need to get more people in the black community to a therapist,” said Colquhoun, getting a big laugh from the mostly African-American crowd. The show has partnered with Black Male Engagement, a national support network, and also wants to create an online web portal for black fathers. “It’s not just a show, it’s a movement,” Carew said. McLaurin was looking for $250,000 for 21 short episodes, seven each to follow three dads. The four other projects in competition included Black Broadway on U: A Transmedia Project, an interactive medley about the largely forgotten Black Renaissance in Washington, D.C., in the first half of the 1900s; Chronicle, an online animated graphic novel following the adventures of black historical figures; The Life’s Essentials Docu-Series, a TV show where celebrities and everyday Americans engage with older relatives; and The Newark Project, a television series about that troubled city’s school reform. An encouraging reception from the crowd augured well that some of these would find backers as well. NBPC’s Fields-Cruz said her Harlem-based nonprofit had already decided to back three of the eight projects regardless of who won. Cheng was scoping out content for WGBH’s World channel. Ingrid Kopp, director of digital initiatives at the Tribeca Film Institute, urged presenters to apply for grants before Tribeca’s current funding round closes May 12. NBPC 360 is partnering with lead station WNET, WTTW in Chicago, WYES in New Orleans, KQED in San Francisco, WGBH/World, American Public Television, National Minority Consortia, South Carolina’s ETV network, BritDoc, POV, ITVS, IFP Made in New York, Tribeca Film Institute, NYC Media, PGA Diversity and Silicon Harlem. 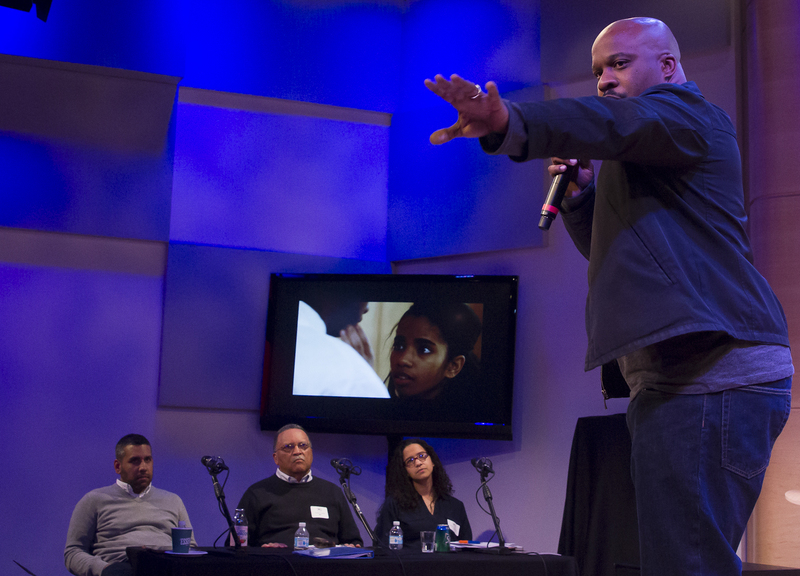 The incubator program opened last October with a call for submissions, which generated 163 entries. Then came a weekly webinar series on the video business and a live-stream event about trends in public television. Eight finalists were invited to join the incubator, a mentored six-week intensive boot camp with hands-on training and preparation for the pitch and pilot phase, culminating in Pitch Black. Mentors included Phil Berelsen (POPS), Joe Brewster and Michele Stephenson (Street Cred), Gaynelle Evans (My Africa Is), Terence Hance (Pixie Dust), Thomas Allen Harris and Don Perry (The Life’s Essentials Docu-Series), Arthur Jaffa (Pixie Dust, Chronicle), Louis Messiah (Black Broadway on U) and Sam Pollard (The Newark Project). 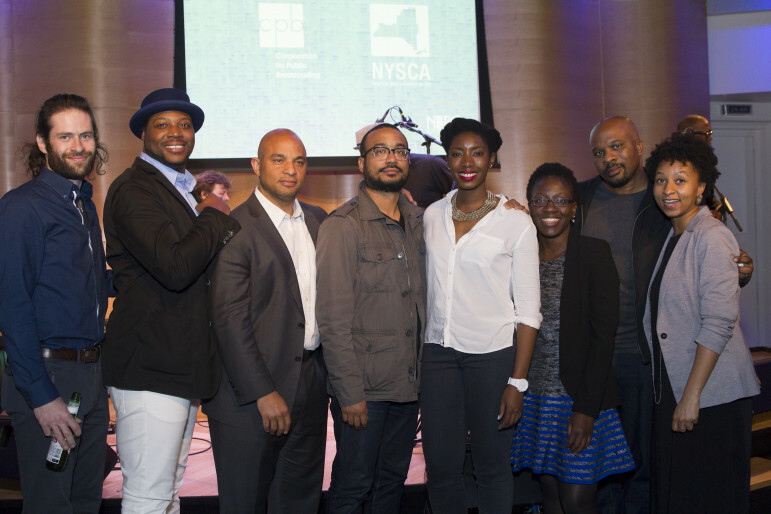 The winners of NBPC 360, from left: Oren Goldberg, Sultan Sharrief, Jason Samuels, Garland McLaurin, Nosarieme Garrick, Hassaton Diallo, Damon Colquhoun, Shertease Wheeler. Correction: An earlier version of this story misstated the focus of the episodes of POPS. Friends and colleagues remember Jones as an advocate for living up to public media’s ideals for reaching underserved audiences.